They have done it: a first airline will get an A350 with 10-abreast seating in economy. Since the cabin of the A350 is narrower than that of the B777, passengers should not expect to have a comfortable flight. It's an alternative yet effective way to promote premium economy. The 3 test aircrafts of the A350-1000 are flying. And sometimes more than one is in the air. If you look in the backlog for the next 300 aircrafts, there are very few. The first client is Quatar, so Airbus must be on time to deliver. The A320neo story is still very fresh. What i dont understand is what Quatar is asking that takes so much time and effort to Airbus ? If you look between roll out to delivery, its much longer with Quatar ? Is it only the cabin and Zodiac ? Or is Quatar checking every nuts and bolts of each aircraft trying to get rebates ? I know its done, just how far do you go ? Airbus says some A350 bottlenecks remain, but the company is on track to manage the 2017 ramp-up on the way towards the production target of 10 aircraft a month by end of 2018. Iqaluit in the Canadian Far North was made famous after an emergency landing of a SWISS Boeing 777 few weeks ago. It comes in the news again. 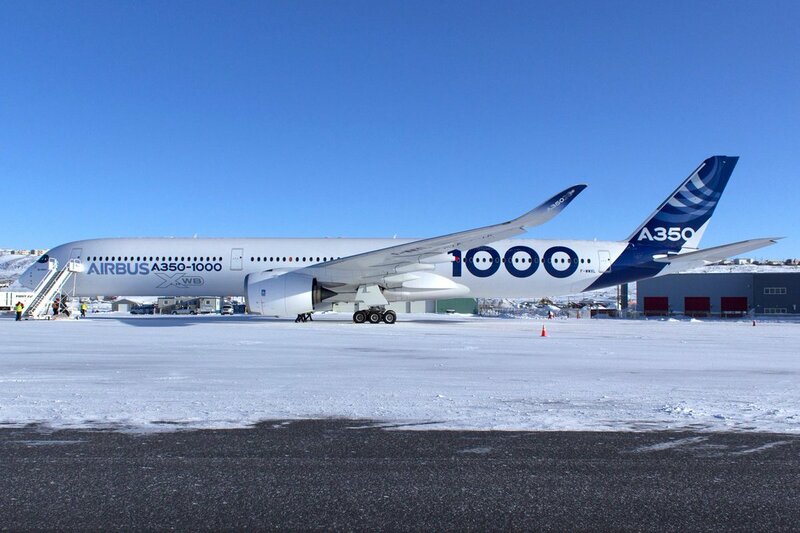 The Airbus A350-1000 arrived there for tests under extreme cold conditions earlier this morning. 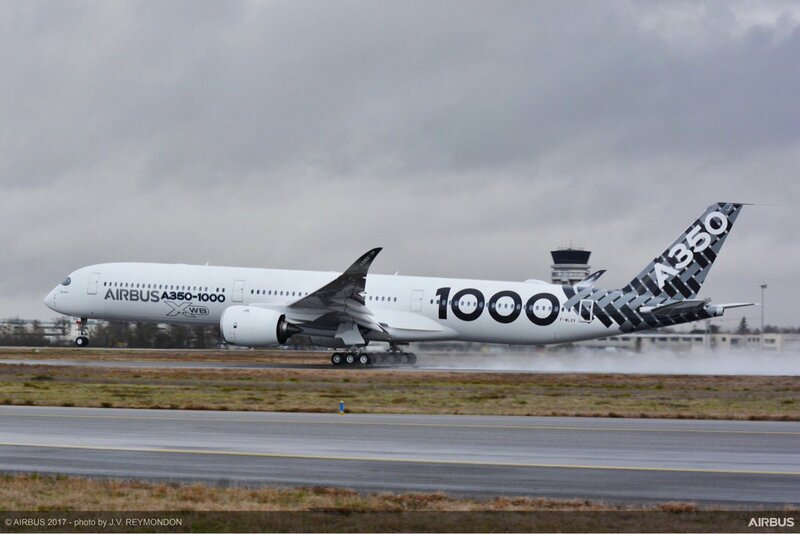 First flight of the third (and last) A350-1000 test aircraft this morning. This aircraft will be dedicated to all tests related to the cabin. 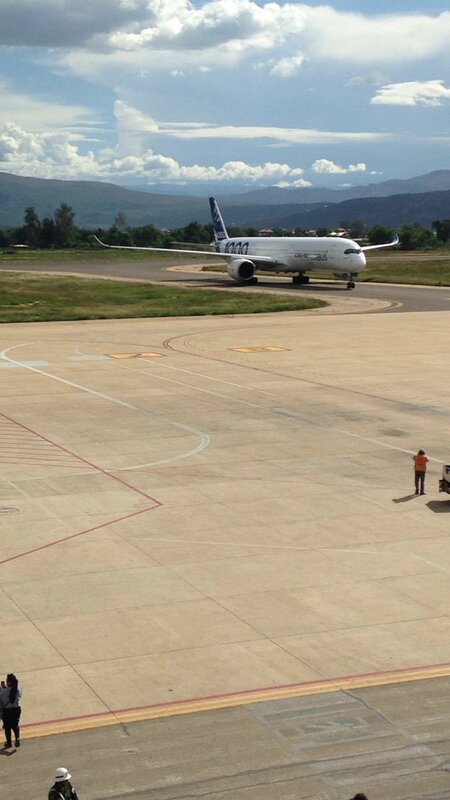 After extreme cold tests at Iqaluit (Canada) with the first one, the second Airbus A350-1000 F-WWXL landed in Cochabamba (Bolivia) SLCB/CBB for high altitude tests. Aeroflot agreed with Airbus to cancel eight out of 22 A350s delivering in 2018, as the manufacturer reportedly plans to end the -800 production due to lack of orders. Carrier still has 14 A350-900s on order, which it plans to buy if on time. 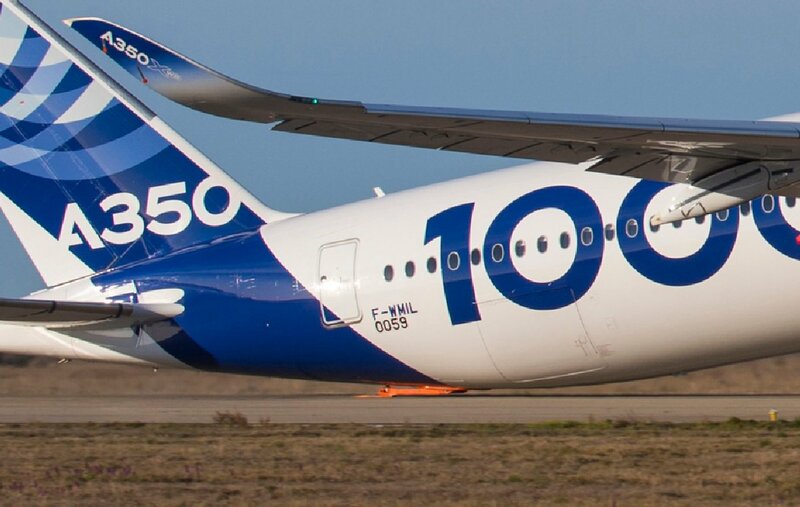 Airbus A350-1000 undergoes low-speed take-off Vmu tests in Toulouse. No tail strike? A special Singapore Airlines A350 service to Perth Airport departed with a low fly past above the city. 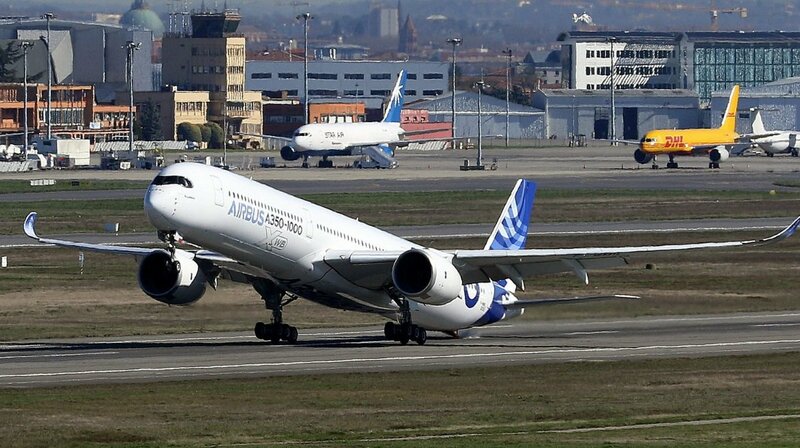 (Bloomberg) -- China Southern Airlines Co. plans to buy 20 A350 wide-body aircraft from Airbus SE in a deal worth about $6 billion, providing a boost for the manufacturer amid production delays and order deferrals. The Guangzhou-based company, which ranks as Asia’s largest airline by passenger numbers, will take delivery of the A350-900s starting in 2019, with all of the planes to be handed over by the end of 2022, according to a filing to the Hong Kong stock exchange Wednesday. The deal for the A350s, which are priced at $311 million apiece but sell at a discount for larger orders, comes amid delivery holdups linked to a shortage of interior fittings for the model. The biggest U.S. carriers have also cooled on the plane, with American Airlines Group Inc. last year deferring delivery of 22 jets by an average of 26 months and United Continental Holdings Inc. saying it may swap its order for A350-1000s to smaller aircraft. China Southern, which recently agreed to sell a minority stake to American Airlines, is buying its first A350s as part of a push to expand the fleet to 1,000 planes by 2020 from 700 now. Adding the twin-aisle aircraft will boost capacity by 12 percent versus the level as of Dec. 31, without accounting for retirements, according to the statement. The carrier didn’t say if it was taking jets made available by deferrals at other operators. Delta Air Lines Inc., which has an order for 25 A350s, also said this month it was reviewing wide-body requirements amid industry over-capacity. Bad news for Airbus: American Airlines is deferring the delivery of its Airbus A350 from 2018 to late 2020. It now expects to receive 22 A350s from 2020 to 2024. Airbus's A350-1000 has completed fuel system tests in the UK as part of the twinjet's certification programme. One of the three test aircraft, MSN71, was flown to Cardiff where the tests were performed over 3-4 May. JAL - Japan Airlines (JL, Tokyo Haneda) has confirmed it is on track to take delivery of its first of eighteen A350-900s on order from Airbus (AIB, Toulouse Blagnac) during its 2019 Financial Year (April 1, 2019, to March 31, 2020). Outlining its Medium Term Management Plan for the years 2017-20, the carrier said it would use the type for domestic Japanese trunk routes before presumably deploying them internationally.